One week after sweeping Alabama Huntsville on the road, it was a lot of the same when the Huskies went into Big Rapids this past weekend. 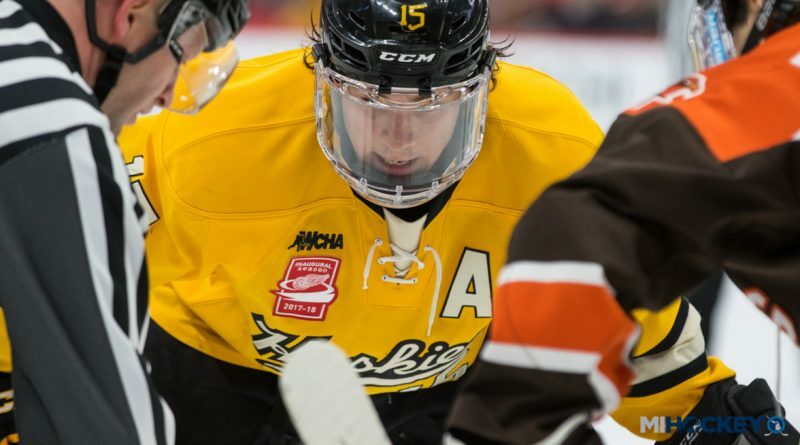 Michigan Tech, having won three of its last four, extended its win streak to four with a weekend sweep of Ferris State. On Friday, it was St. Clair Shores native Justin Misiak who broke a 4-4 tie at 12:45 of the third period to lift the Huskies to the win. Jake Luchinni collected a pair of helpers, while Houghton native Raymond Brice potted a goal and an assist in the contest. Junior netminder Matt Jurisik stopped 23 of 27 shots to improve to 4-1-0 on the season. St. Clair Shore native Marshall Moise scored twice for the Bulldogs in the loss, while Jason Tackett posted a goal and two assists. On Saturday, Michigan natives found the scoresheet often, as Tommy Parrotino (Rochester Hills) and Coale Norris (Oxford) each scored in the opening frame to set up a 1-1 tie going into the second. After the Bulldogs took a 3-1 lead early in the second stanza, the Huskies scored three times in 5:05 to climb back and take the lead through two periods. That was all it took to hold on, as neither team struck in the third period. Defensemen Cooper Zech (South Lyon; 0-3–3) and Nate Kallen (Muskegon Lumberjacks alum; 1-2–3) each posted three points in the game for Ferris State, while Lucchini added another three points (2-1–3) for five on the weekend.